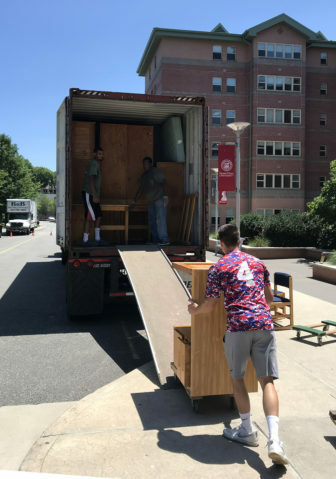 Sacred Heart University in Fairfield donated 15 shipping containers filled with more than 3,500 pieces of furniture from the Elizabeth Ann Seton Residence Hall to orphaned children in Guatemala this summer. Through the nonprofit organization Asset 360, SHU donated used desks, chairs, dressers, wardrobes, bedframes and mattresses. Asset 360 is nonprofit environmental company that manages the responsible disposition of materials that are no longer needed. Joel Quintong, assistant dean of students, said that almost every year, one of the residence halls turns over its old furniture. He said this year, he wanted to find a responsible means of removing it, rather than having it all end up in a landfill. They say they can’t give away this much furniture in this area, but an organization exists to ship it where it will help. Residential Life tries to give away the furniture, but many local organizations are not able to take on such a large donation, Quintong said. Quintong and the Residential Life team were thrilled to learn Asset 360 was interested in obtaining the old furniture. “They handled all the logistics,” Quintong said. A contractor was hired and the furniture was removed, prepared and shipped off to people who need it the most, all within a week and a half. According to Asset 360, they shipped 3,516 pieces of furniture from the residence hall to El Rosario, Guatemala City, Guatemala. The furniture will be reused in residential campus settings for orphaned school-aged children. Sacred Heart University has established an online forum to help rebuild the Catholic Church in a time of disunity and spiritual decay. The forum, “Go, Rebuild My House,” will serve as an open forum and allow experts from all over the world to contribute posts.